Lanie didn't bother. She giggled out loud, so Hop turned his head to watch her beautiful face beaming bright with happiness and he did it until he was sure he'd go blind. "I think I need to lie here and stare at you for about thirty more seconds," she whispered and Hop felt his lips twitch. Then he offered quietly, "Have at it, baby." "We don't have a future," I informed him. "We have a future," Hop informed me. "Anything you need, lady, I'm there for you one way or another." When he lifted his head, I whispered, "I better let you go." "Honey," I called and his head came up. "You have a monster too." "I did. My woman just slayed it." After reading, and loving, Own the Wind, I was more than ready to jump into this next book in the Chaos series. Especially since Tabby learning Hop and Lanie's story set her into such hysterics--I was curious what was up. Other than those two factors, though, I didn't really have expectations for this one. I probably would have had more if I'd read the Dream Man books first--particularly Motorcycle Man--but I did not, so there you have it. Still, this is a KA book. I had no doubt I'd enjoy it, and yet again I was right. I so, very much enjoyed Fire Inside. Hop and Lanie's story happens pretty much at the same time the meat of Shy and Tabby's story is going down, though we don't see much overlap. A few clear parallels here and there, a mention of Shy not being with a random girl for once, stuff like that. The main focus of Fire Inside is Hop and Lanie and how they get together--and then make things work for them to stick long term. Pretty much all of this story was enjoyable. However, I wished they didn't have to spend so long keeping things secret. They weren't the best at keeping it secret, but it would have been cool for them to have more time without the worry of being covert. Regardless of being secretive, Hop and Lanie's story is still completely romantic, and exactly what I'd expect from Kristen Ashley in all the ways I love. I have SO MUCH highlighted throughout my e-book because the book was full of sweet words, and quotes I liked, and things that made me laugh. Lanie and Hop are a hoot, and they make a magnificent pair. Swoons galore up in here, y'all. Lanie has issues she really needed to sort, which were the stem of the reason they kept their relationship secret. She needed to work on the weight on her mind--what they call her monster--before she could be loud and proud in a new relationship. I get this. I truly do. The keeping it under wraps thing bothered me a little anyway, but that wasn't a huge downer, simply more of a side thought I have now thinking back of what it was like reading. And I liked Lanie. She's a good person, and I'm glad she got to find her happiness with Hop. Speaking of Hop, I ADORED him. This was somewhat surprising to me, for what reason I have no clue, but I'm glad. He said so many wonderful things, and he meant every one. He could be a douche in arguments when he got angry, but that's easily forgiven when he owns up to that. He's just an all around awesome person. A lesser man would have given up on Lanie, but Hop, as he liked to say, loves a challenge, and he took that and ran with it. That's the kind of thing that really proves the greatness of a person. And honestly--I just seriously fell for Hop. In typical Kristen Ashley fashion, she turned this story into one I loved without a doubt. I went in unsure, and it didn't take long at all to turn heads over heels for these characters and where their story would go. 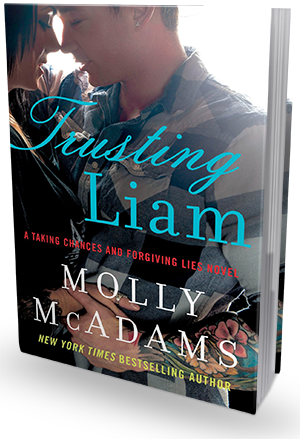 Lanie and Hop were deep characters I enjoyed digging into, and seeing their relationship turn from one night into something lasting warmed my heart incredibly. And Hop has two kids--both were included in the story in a way that was done well but not over the top, which I so appreciate. And they were darn cool kids. 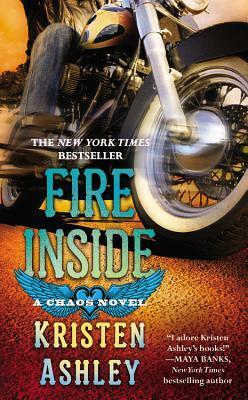 Overall, Fire Inside was an enjoyable addition to the Chaos series that pulled me in hook, line, and sinker, and held me under the whole way through. Hop and Lanie's story is one I'm glad I got to read, and I am seriously looking forward to jumping into the next book, Ride Steady, sometime in the near future.